and can be used by project managers for planning and/or for field engineers to help contractors identify areas needing attention. Corporate managers and stockholders, even when located far from the project location are kept well informed of the progress. 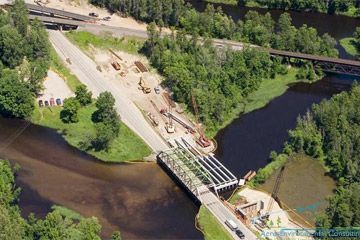 Aero-Environmental Consulting LLC provided construction progress aerial photography services for a large project for monthly for over two years. Here is a link to a composite gallery showing the project from basically "dirt" to plant start-up: http://tinyurl.com/738zmtp. Aero-Environmental Consulting LLC solves the problem of assessing actual "as is" conditions at project sites by providing aerial photographic enhancements for environmental site assessments, geologic and hydrogeologic investigations, wetland delineation and storm water management projects. Aerial photography for site inspection, construction progress, remediation and/or restoration compliance documentation is also provided.